Make a toast to showcasing up to 12 wine bottles with the Sorbus 3-Tier Wine Rack! Created with timeless style, this stackable 3-tier stand is perfect for both new wine collectors and expert connoisseurs. It's functional, coordinates well with existing décor, and ideal for any flat surface area in a pantry, storage cabinet, kitchen, dining room, basement, wine cellar, or bar. With a beautiful circular frame, each wine bottle is stored horizontally ensuring both the wine and the air bubbles are in contact with the cork. Its versatility allows you to customize your space by stacking vertically or side by side without wobbling or tilting. Designed with small spaces in mind, this lightweight wine rack is a great for counters and cupboards. Perfect for entertaining, this 3-tier wine rack can transform any space into a home bar. Entertain family and friends with your finest selection of prime wine, spirits, and sparkling ciders. Spread cheer during holidays, special occasions, or cocktail hour with customizable shelves for your very own wine tasting room! Serve guests during major sporting events, plan a romantic dinner, or simply relax and enjoy a bottle alone from your stacked wine cellar. The possibilities are endless! A clever design and sturdy construction prevents wobbling, tilting, or falling. The 3-tier stackable rack is constructed from high quality metal with circular shaped shelves. Stack additional layers for extra capacity. Minimal assembly, no tools required. 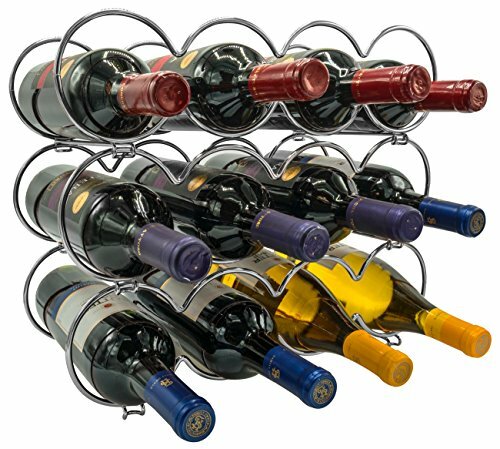 Holds most standard wine bottles and up to 4 bottles on each tier (12 bottles total). Measures approximately 15.50" L x 6.50" W x 12.75"H.
Add multiple stackable wine racks for additional storage and create the ultimate wine cellar!